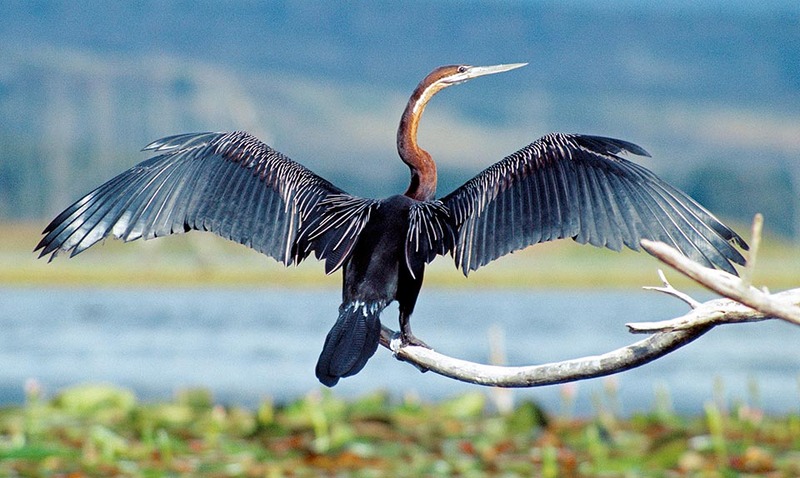 The African darter or Snakebird (Anhinga rufa Daudin, 1802) belongs to the order of the Suliformes and to the family of the Anhingidae and is a bird strictly linked to the water where it spends practically all its life. The only moments it spends with the feet dry are during the hatching in the period of nidification and when out of the water, stays for long time with the wings spread for drying up after a fishing expedition. As happens for the Cormorants (Phalacrocorax sp.) the feathers of the anhinga are not intentionally smeared with that oily fat typical to the aquatic birds that maintains the feathers dry during the stay in water, therefore the immersion is considerably facilitated by the heaviness obtained by the soaked feathers that almost cancels the typical very strong upwards thrust of the waterproof bodies. As a consequence this means that the waterline of these birds, when in the water, maintains a very low centre of gravity allowing the body to remain totally immersed whilst the neck remains outside and exposed like the periscope of a submarine. 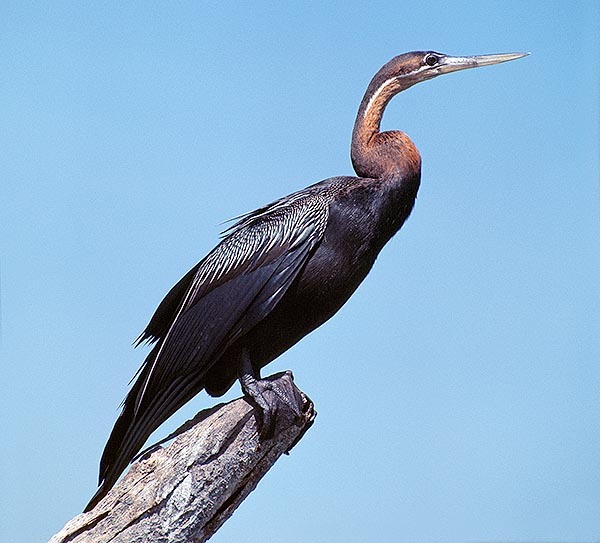 This posture has suggested in the populations that know it, the nickname of “snakebird” because at the view it appears as the head of a snake that is swimming in the water. The scientific name of Anhinga comes from the homonymous term used in the Tupi Guaranì to indicate this bird, a linguistic group of the Amazon jungle that has been a reference for many authors in the classification of numerous species of animals coming from that territory. It is sufficient to recall other terms such as jaguar, nandù, ara, toucan or the most current carioca, tapioca, capoeira. It is funny to think that for an African bird and for other Asian congeners is used a scientific term coming from a language spoken at tens of thousands of kilometres far away! The name of the species rufa comes, on the contrary, from the Latin and means red, reddish, rusty due to the colour shown on the neck and on the chest by this species. 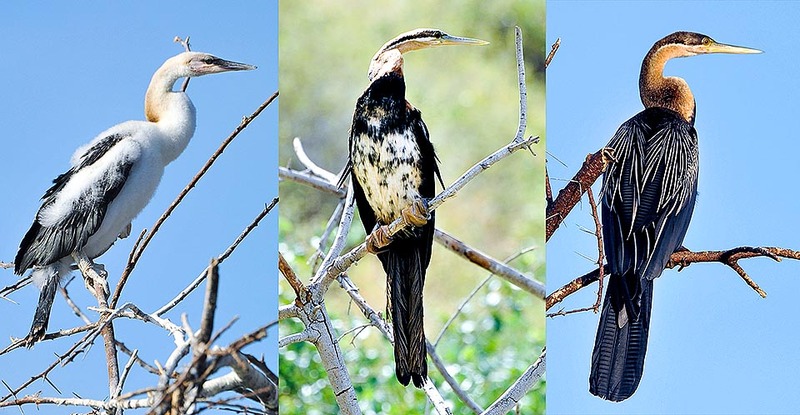 Other vulgar names are: in English, African darter; in German, Afrika-Schlangenhalsvogel; in Spanish, Anhinga africana; in French, Anhinga d’Afrique; in Portuguese Mergulhão-serpente and in Italian Aninga africana or Uccello serpente. 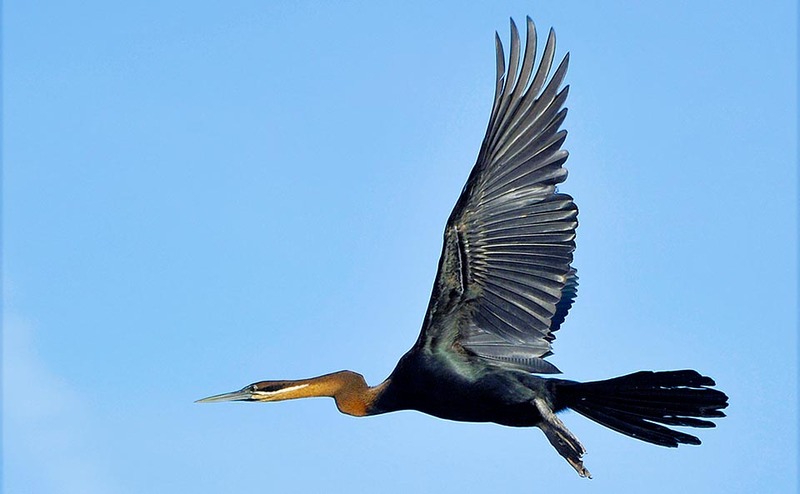 Last linguistic curiosity: in the Anglo-Saxon world, place that has originated the modern ornithological culture, the anhingas are called Darter, from “dart” , arrow, to mean somebody or something that moves rapidly, in a whippy way. As a matter of fact, during the under water hunting, this bird darts at an impressive speed. As its common names states, the African anhinga is typical of this continent even if there is still a very small colony, surviving in Irak, of the subspecies Anhinga rufa chantrei, now confined in a humid area and at risk of disappearance. This subspecies survived, decades ago and always in a meager number, also in Anatolia and in Israel, but the drying up of the frequented areas has led to the natural disappearance of this bird. In Africa it lives extensively in all the sub-Saharan part with exception of the desert zones and of an ample western area. It is a sedentary species and the only movements are done during the dry season when some swamps get dry obliging these birds to move looking for new marshes and flooded areas. 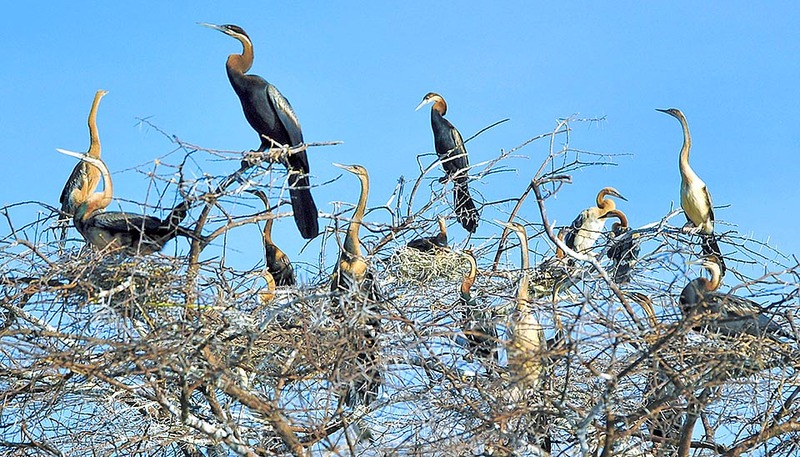 Excluding Europe, the anhingas are present all over the world and are divided into four groups that more or less identify the continents where they live. In the Americas the Anhinga anhinga, in Africa the Anhinga rufa, in Asia the Anhinga melanogaster and in Australia the Anhinga novaehollandiae. It is practically impossible to observe this bird far away from water bodies nor to see it flying freely in the sky for reasons other than that of moving from one water body to another. However, at times it is seen as being bewildered, gliding high in the sky as if it wanted to get free from the very strong link with the water but its life is inseparably linked with this element without which it would rapidly pass away. 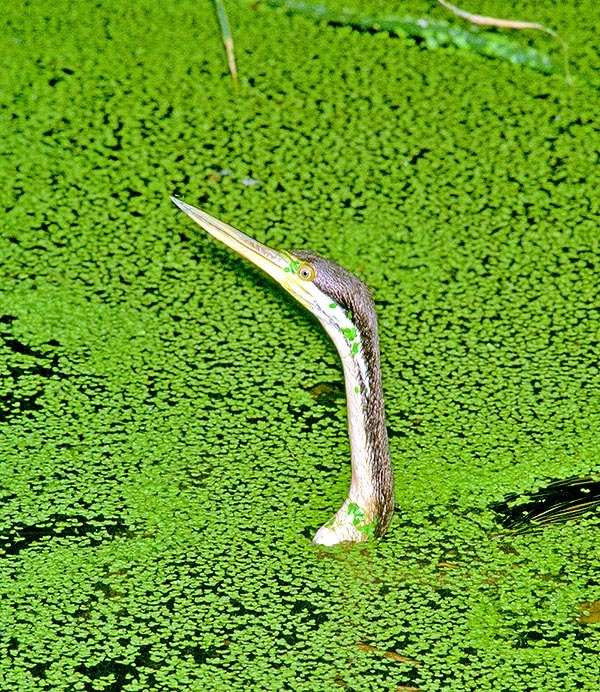 On the other hand, it is fairly difficult to see swamps, lakes or slow water streams without seeing it with the wings spread to dry up in the sun or with the typical snaky behavior, moving in the water bringing outwards only the long and very thin neck. It’s a common bird, easy to observe due to the strange modalities it adopts as well as due to its considerable size. It much prefers still but clean and limpid waters in order to be able to locate the preys while darting under the surface but does not disdain also reduced water bodies, loops of rivers with banks covered by reeds and exceptionally also dams, reservoirs or human artifacts. Never in marine environments except in some rare occasion in mangroves in coves deeply wedged in the coastal forests. Essential for satisfying at the best their requirements, is that of having available dry trunks emerging from the surface, on which to perch after the very long fishing trips, operations it carries out often mixing with the cormorants that share the same exigency. Besides the need of drying the feathers, these birds have the need of thermoregulating the body temperature consequently to absorb as soon as possible the rays of the sun for possible problems of hypothermia. Real reptilians with the feathers! It is clear that its presence indicates that the environment frequented is rich of fishes and in the meantime free from pollution and therefore ecologically sound. Its cohabitation with the Cormorants (Phalacrocorax sp.) and other diving birds does not show any social friction nor even alimentary antagonism. The anhinga is a big bird that does not go unnoticed, seen that its wingspan is of about 115 cm, with a length of 90 cm and a weight of about 1300 g.
A very long and tapered body suitable to underwater sailing with a long and slender neck, armed with a very long and pointed bill that works as a real foil during the underwater fishing. The head is small and is also very tapered seen that it works as the ogive of a torpedo and must pierce the water without meeting the least resistance. The neck has a special conformation between the eighth and ninth vertebra that allows the bird to bend and use, like a snapping device, to hit the prey. When resting, this joint is well visible as an anomalous swelling on the neck. The tail is very pronounced and is used as a rudder for zigzagging quickly while chasing the preys. The whole is accompanied by two webbed feet of exceptional dimensions that produce an extraordinary boost to a being already itself built for penetrating into the water. 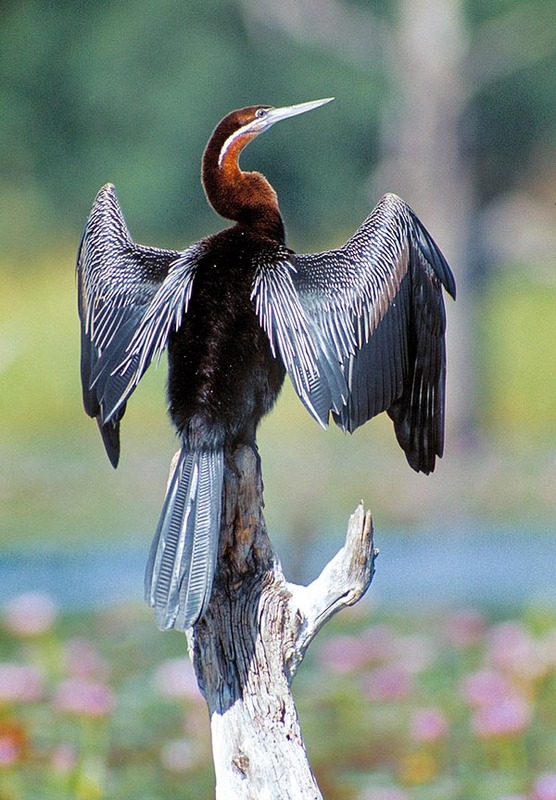 The African anhinga, as well says its scientific name, has a reddish colour evident on the neck and the chest whilst the rest of the body is blackish in the upper and in the lower part. The paws are also dark greenish whilst the bill is usually yellow in particular during the reproductive season. The adult male has more evident and reflecting colours whilst the female and the young show a browner and more opaque livery. 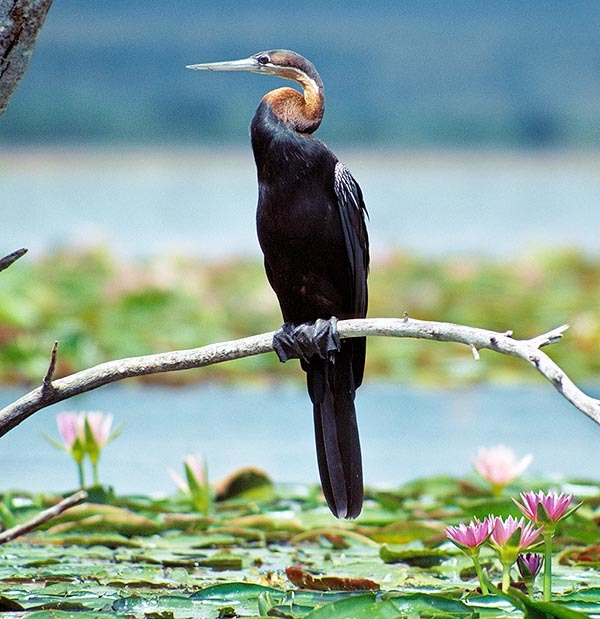 The nidification of the African anhinga takes place during the whole year in relation with the ambient conditions and is regulated by the level of the watercourses where it lives. Usually it begins in the humid season with the peak by the beginning of the dry one when the temporary decrease of the level of the waters increases the concentration of fishes in the remaining ponds. It places the nest on low branches of nearby trees and shrubs or hanging on the water in mixed colonies with ardeids and cormorants, building a wide platform of brushwoods where it lays 3 to 6 whitish eggs. At times the nest is placed directly on a bed of flat reeds, but always close or at the feet of a colony. The hatching lasts averagely three weeks, is done by both sexes and the chicks remain in the nest for 6 weeks more during which they often fall into the water below or go around clung to the close branches. The nest is well visible and of course is often subject to plundery by the raptors living and nidifying close to the colony benefitting of this usual pantry. Typical are the African fish eagle (Haliaeetus vocifer), il Nibbio bruno (Milvus migrans) and also the Harrier hawk (Polyboroides typus) classical raptor of eggs. The anhinga is a large consumer of fishes but catches indifferently all what is moving in the water, from snakes to crustaceans, from mollusks to aquatic insects. In some areas where there are fish farms, the species is fought for its greed and for the damages it may cause during its raids. It is not an endangered species. Anhinga africana Daudin, 1802; Plotus rufa Daudin, 1802.